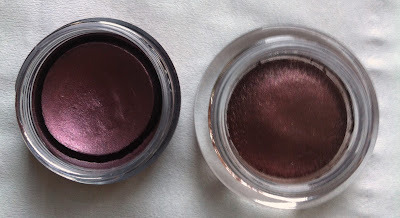 Make Up For Dolls: Burgundy Part II: And on to The Makeup! Interpret burgundy however you wish; oxblood, wine, claret, bordeaux, aubergine, eggplant, cranberry, plum, purple, blood, maroon... I'm in lust. 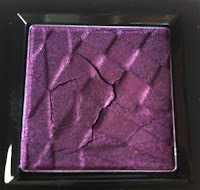 MAC Extra Dimension Eyeshadow in Rich Core (Extra Dimension collection) - described as "dirty aubergine"
MAC Paint Pot in Hyper Violet (Posh Paradise collection) - described as "deep violet" but is quite a plum shade. 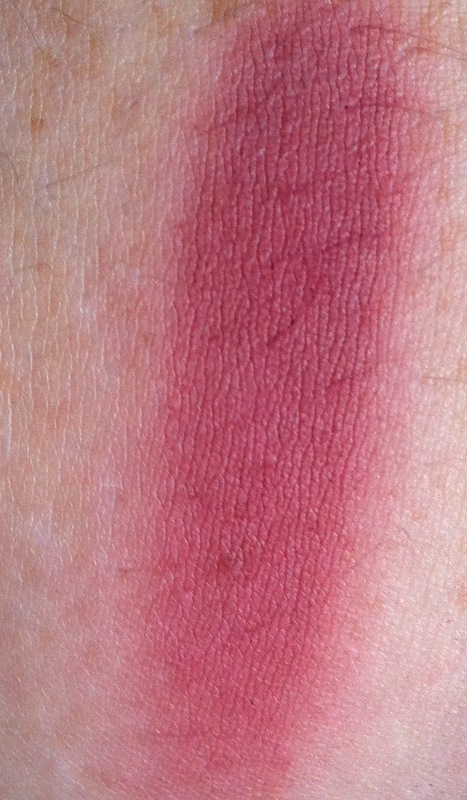 I like it, but like a lot of purple shades, it's hard to build-up adequately without looking patchy. 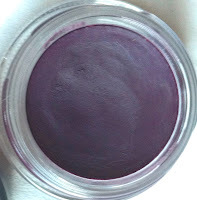 Make Up For Ever Aqua Cream #17 (permanent line) - described as "burgundy plum shimmer", this is essentially the same as the (now sadly discontinued) MAC Paint Pot in Artifact, which I never managed to get my claws on. My favourite? Probably the Make Up For Ever Aqua Cream; I love this. I also love the MAC Extra Dimension Eyeshadows in Round Midnight - speaking of which, notice the size difference between this one and the (much smaller) Rich Core shadow? Same formulation, much smaller size. Hmmmm. 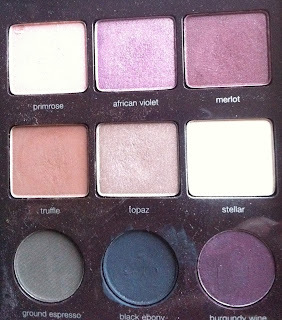 I have sooooooo many powder eyeshadows that are not strictly burgundy but that could work as a burgundy over a darker (brown or purple-based) primer; MAC Cranberry, Star Violet, Trax, Signed, Sealed... A bunch of shadows from various Sleek palettes. 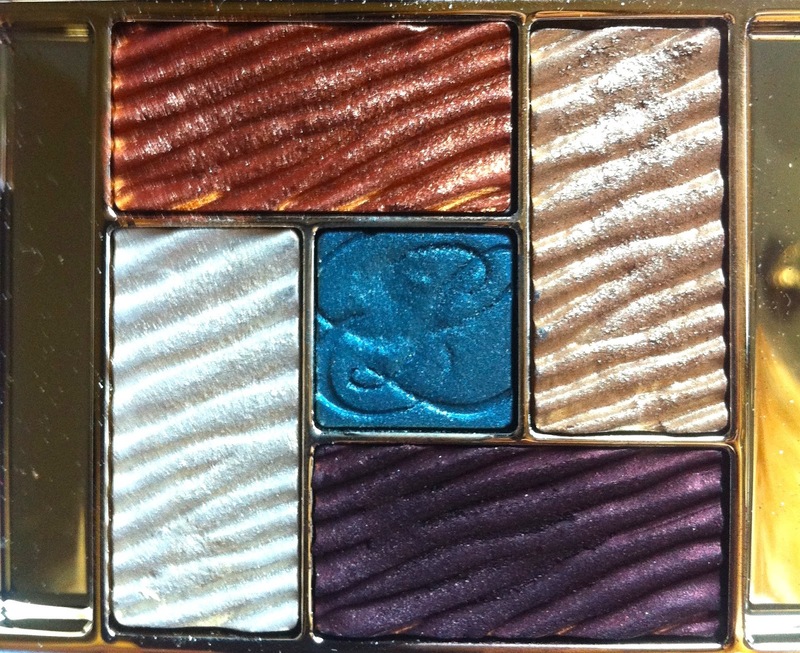 A No7 Metallic Shadow that I can't find right now (part of a palette of four)... some Estée Lauder shades from various palettes... far too many to swatch and photograph. 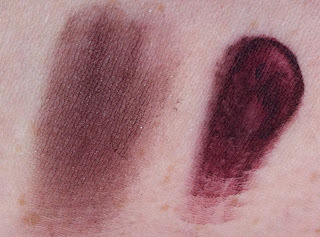 The top six shades are eyeshadows, the bottom three are cake liners (mix with water or an eyeliner mixing medium to get a liquid liner). I particularly love the Burgundy Wine cake liner. Merlot is a sateen eyeshadow and is available individually, the cake liner was LE and only part of this palette. 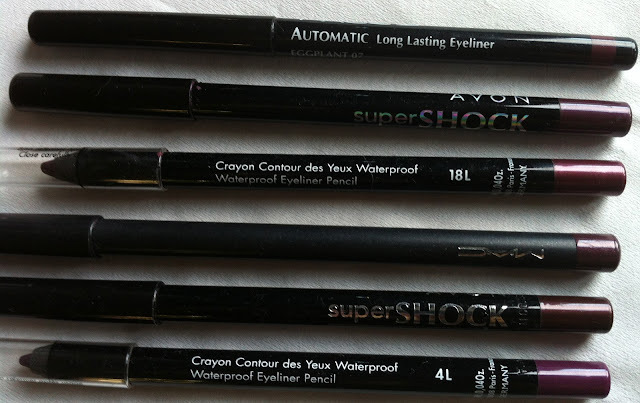 My two favourites, hands down, are the Illamasqua Precision Ink in Havoc (liquid liner) and the Avon Supershock Gel Liner in Blackberry (pencil/gel hybrid) - I believe the latter was LE, but the Illamasqua liner is available from their site. 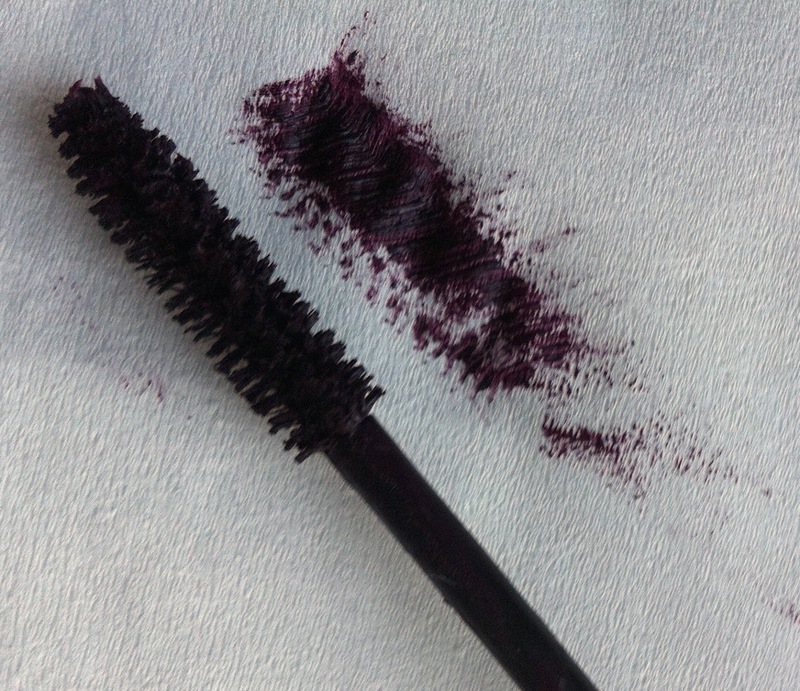 This one was simple - one of my absolute favourite mascaras, the Yves Saint Laurent Faux Cils in #5 (Aubergine), not cheap but a gorgeous mascara. A burgundy-toned mascara will really make green eyes pop! Not sure if this has been discontinued or not, but Dr. Hauschka also do a mascara in this colour, as does The Makeup Store and Laura Mercier. I know that there's a bunch of coloured mascaras available from drugstore brands (like Barry M etc) but I think they're more blue-purple than burgundy. MAC Sin (matte) - according to MAC, a "deep dark blue-red"; this is a matte shade and quite a yummy dark purple-toned red. Chanel Rouge Noir (Rouge Allure) - recently reviewed here. 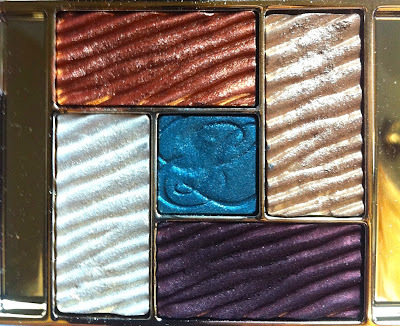 Note that the Chanel Christmas collection this year (2012) is also largely based around a variation of this colour (see here for more information on this collection). 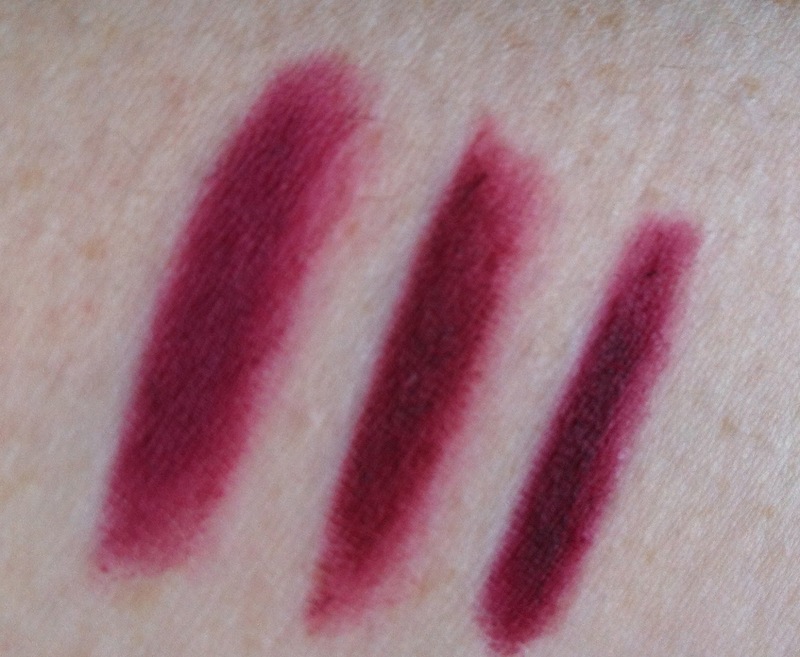 NARS Damned (Velvet matte lip pencil) - While I'm not the biggest NARS fan on the planet overall, I adore this formula lipstick. This shade is described as a "rich magenta", and it's handy to carry around, long-lasting, pigmented and doesn't dry your lips out unduly, which is good for a matte lipstick. 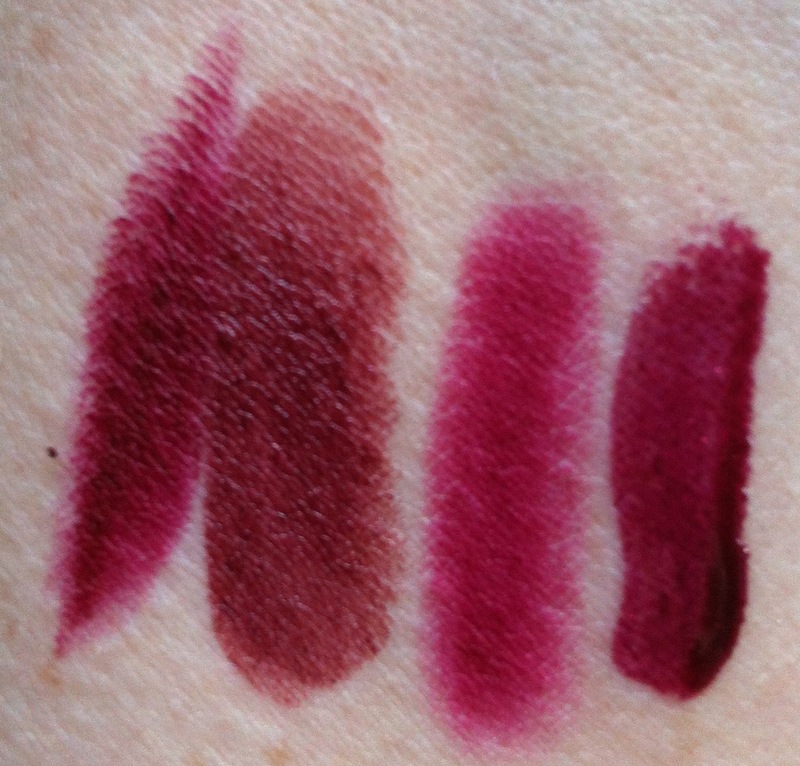 NARS also has shades Toundra and Train Bleu, which are in matte, and Club Mix (a velvet gloss lip pencil) which are other colours that could be considered part of the burgundy family. Dior Addict Ultra Gloss #982/Black Tie Plum (flash) - I love love this lipgloss, it's flashy, iridescent, sparkly but dark and moody at the same time. My latest love is Chanel Rouge Noir with this layered on top, a clean eye with a flick and a very simple, pale, matte base with lots of contouring. Yum. A shout-out must go to Ben Nye's Lip Color in Vixen... I forgot to swatch it, but it is gorgeous stuff, and like all Ben Nye products, inexpensive, pigmented, easy to apply and long lasting. The fun thing about lipsticks... it's the one thing in makeup that's really easy to frankenstein. Don't have a burgundy lipstick? Apply some lipbalm, then a dark brown eye/lipliner all over your lips and blend a dark red on top of this... or use a black or a purple eyeliner with a red lipstick on top... you get the idea! 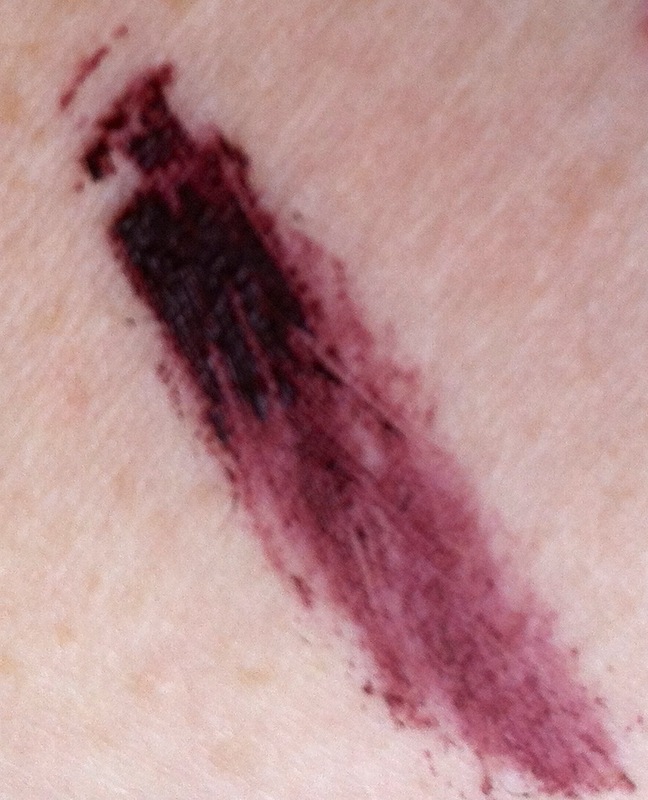 The lipliners I chose are largely a plum-shade of burgundy, and they're photographing badly (grrr). As mentioned, these are photographing a little brighter than they are in real life, but the tones are about right. These are fabulous on their own, or as a nice dark base for a dark blue-red shade. All are very pigmented (I think the Lancôme one might be discontinued but I'm not 100% certain). Rimmel lipliners are absolutely brilliant, well recommended despite their very inexpensive price tag, and I know most makeup artists use 'em. Black Tulip is particularly gorgeous and a shade I use a lot. 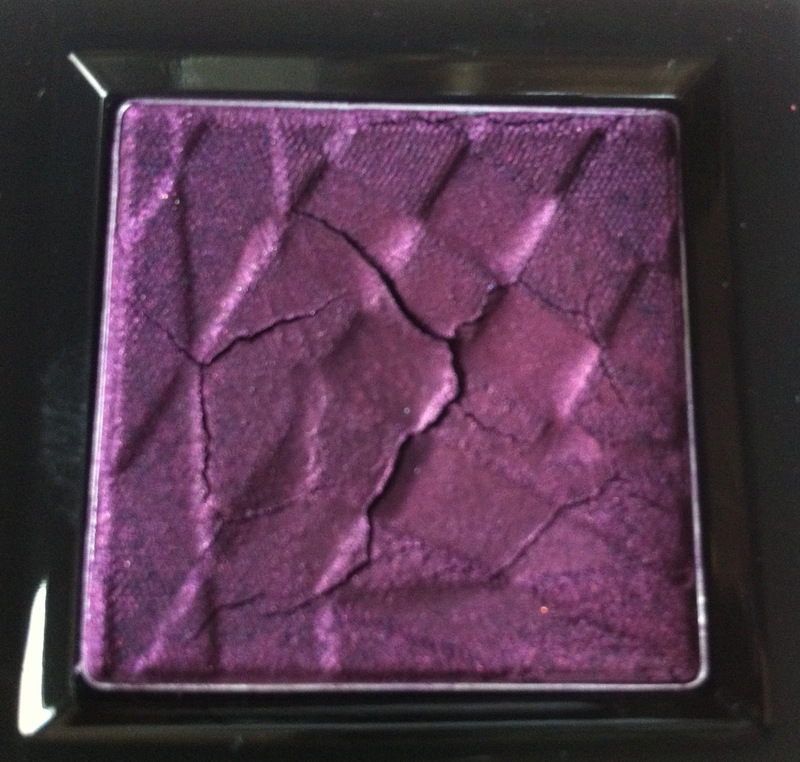 It's hard to get a burgundy blush, no matter what way you look at it, at one end of the spectrum you're looking at a dirtied-brown-toned red... at the other end, a purple shade. Neither particularly appealing from a wearability perspective. 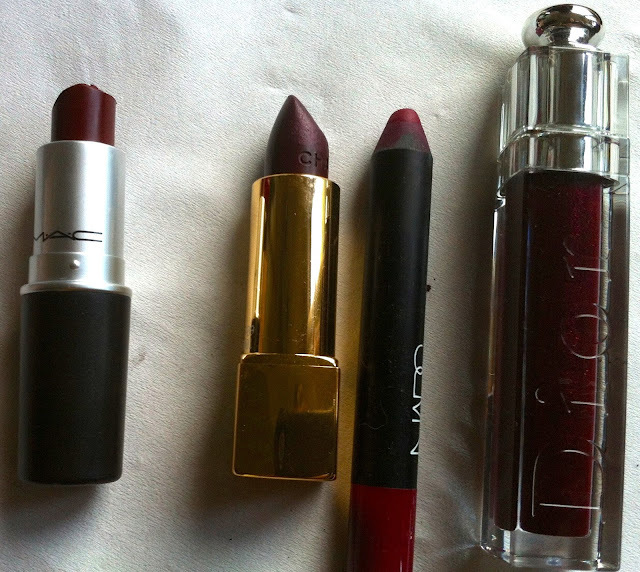 So I raided my stash to see if I could find something more plum than mauve, more cranberry than brown-red. Described by nails inc. as a "deep cherry red shade", this is actually close to a spot-on shade of burgundy for me personally, it's a nice mix of red and cherry and wine and purple. A touch more of a brown undertone and it'd be perfect (of course, this can be achieved by using a brown undercoat). Thus endeth the rooting-around-my-stash-to-see-what-burgundies-I-have. Burgundy, as you can see, really is one of those "subjective" colours, and if you don't have it, can be formed by combining a few different shades; browns and reds, purples and reds, berry shades and browns/blacks... just remember that the reds need to be blue-based, not yellow, pink or orange-based, and you're sorted. 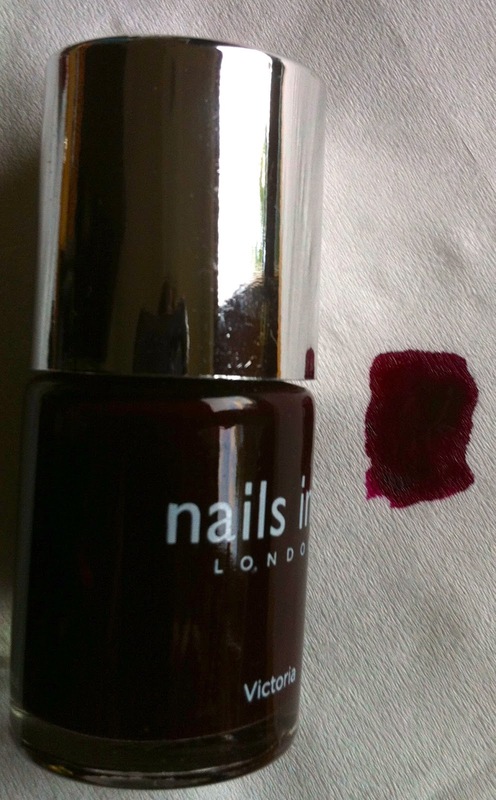 Burgundy, together with olive green and black are the real trend colours for AW12; luckily, all colours that I love and that work with my colouring. Just be careful with burgundy close to your eye - if you're using a very red-toned burgundy, you run the risk of looking sick or vampiric (I know it's nearly hallow'een, but still!) 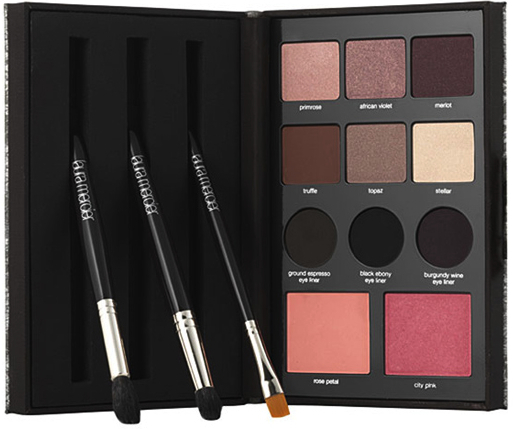 - in this case, just make sure that you have delineated the burgundy shade from your eye using a nice crisp black liner, and you're good to go! In an ideal world, I'll find time to put together some face charts with burgundy looks... maybe I'll look at this as Part III, hopefully next week!